Dr. Morgan is a Radiology Informatics Fellow and Dr. Chang is Chief of Radiology Informatics, Department of Radiology Informatics, University of Pittsburgh Medical Center, Pittsburgh, PA. This work was funded in part by a Society for Computer Applications in Radiology (SCAR) Research Grant and has been accepted for presentation at the SCAR meeting: Morgan MB, Branstetter B, Chang PJ. Flying Blind: Using a Digital Dashboard To Navigate a Complex PACS Environment. Paper to be presented at the SCAR Annual Meeting; June 3-6, 2005; Orlando, FL. With the explosion in technology over the last decade, radiology departments have undergone radical changes. Picture archiving and communication systems (PACS) are replacing film-based file rooms, computer workstations are replacing florescent light boxes, and electronic worklists are replacing paper requisitions. In making these transitions, radiology systems and their underlying infrastructures have become increasingly complex. Without film and paper, fewer tangible cues are available to the radiologist to help optimize task prioritization and selection, and with exploding data sets and imaging requests, the radiologist risks information overload. Computer system administrators are faced with the task of the coordination and orchestration of hardware, software, and network infrastructure to support complex workflows. As these systems grow in size, scope, and complexity, monitoring them can be a significant challenge. Radiologists and computer system administrators are faced with the task of operating within complex systems but lack the tools to efficiently and effectively monitor them. "Dashboards" address these challenges by displaying small, defined sets of key metrics that allow quick evaluation of system state. Just as the dashboard in an automobile gives the driver a summarized view of the state of the car (Figure 1), a radiology "dashboard" could give radiologists and system administrators real-time, context-specific information for optimized decision making. There are no commercial PACS dashboards, as such, at the current time. The novel solutions described in this article are being developed in the Radiology Informatics lab at the University of Pittsburgh Medical Center (Pittsburgh, PA). Stentor PACS (Stentor, Inc., Brisbane, CA) provides the flexible platform for our local Informatics engineering team to customize to fit our local needs. Advances in technology have created new workflows and organizational models. In the past, to keep work moving forward, a paper requisition form was passed from person to person like a baton in a relay race; today, many departments have paperless, "decoupled" workflows that allow workers to function more independently and efficiently. Radiologists used to gather in reading rooms that were physically located near the referring clinicians; now groups of radiologists often work individually and may be separated by miles (or continents) from the referring clinicians. In the past, film cost and distribution constraints limited the availability and number of images; today, faster scanners and more detailed examinations coupled with digital image management has created on-demand, enterprise-wide image distribution of seemingly limitless data sets. As is common with many emerging technologies, the increased power and capability of modern image management systems has brought new challenges and complexities. In the days of film and paper, tangible cues helped the radiologist manage and prioritize their workflows. It was easy for the radiologist to look around and see the stack of films that needed to be dictated, and if there was a priority case, radiology technologists would personally deliver it. Now with electronic worklists and paperless workflows, radiologists have lost many of these tangible cues, resulting in greater potential for studies to "fall through the cracks." In the past, the close proximity of radiologists-both to each other and to referring clinicians-contributed to a sense of continuity and kept the radiologist an engaged and vital part of the clinical team. With PACS, today's radiologists are often distributed over large geographic areas and may be distant from referring clinicians. Though the geographic distance may increase flexibility for the radiologist, the professional distance heightens the risk of the radiologist becoming marginalized or-even worse-irrelevant. In the film-based world, radiology departments controlled access to the images in film libraries, thereby affording more time for report turnaround; now PACS permits 24/7 universal and almost instantaneous access to images, increasing pressure for faster reporting (ie, "I can see the images. Now why can't I see a report?"). Finally, image management systems in the past consisted of basic, self-contained libraries of film and paper requisitions; now there are multiple, distributed computerized information systems (eg, PACS, radiology information systems [RIS], report dictation/speech recognition systems, and the Electronic Health Record), each requiring unique expertise and training. All these issues define a growing problem for radiologists and systems support personnel-how do you "stay on top" of all the states of these complex systems? We need a system to monitor all of our systems-we need a meta-system. Not unlike a novice driver behind the wheel of a Formula One race car, today's radiologists and system administrators sit at the controls of a high-performance PACS but lack the tools to "drive" it effectively and efficiently. Additional tools are needed to help navigate, monitor, diagnose, and repair the complex systems and the complex workflows that use them. Imagine trying to race in the Indianapolis 500 without any feedback mechanisms. Yet, today's radiologists and system administrators are "driving blind" when they can't see the state of their systems. As with other industries, radiology (and healthcare in general) would benefit from a "dashboard" to consolidate and summarize key information from multiple interfacing computerized information systems. 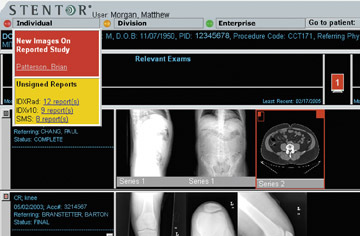 Just as an automobile dashboard summarizes variables, such as speed and fuel level, a digital radiology dashboard could summarize key information about the states of radiology computer systems and the departmental workflows. These monitoring tools could track individual, departmental, and enterprise level information spanning across multiple systems and could alert users when appropriate and contextually relevant. This would enable users to make appropriate, real-time, pre-emptive decisions rather than passively waiting for problems to manifest themselves. In other words, it is not so much "Big Brother" as it is Formula One "telemetry" (remote system surveillance) that keeps you aware of your system's state. Why will radiologists like it? A dashboard has numerous potential benefits for the radiologist. First, a dashboard gives the radiologist the opportunity to be a better doctor for both patients and referring clinicians. For example, a dashboard element could help triage urgency. When there is a priority case, a dashboard element could elevate its visibility to the radiologist so that it is read promptly. This not only results in better patient care, but it keeps the radiologist relevant as an engaged member of the clinical team (Figure 2). 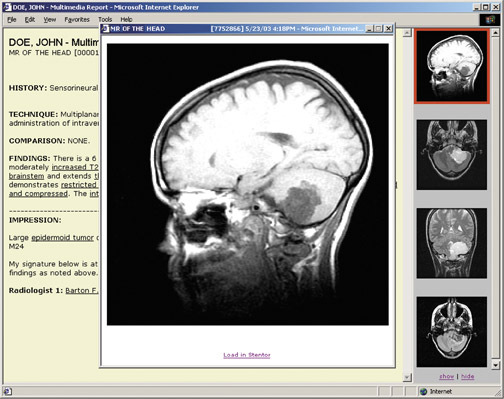 Also, a dashboard could streamline the radiologist's daily work by integrating multiple disjointed computer systems. Where radiologists are now often required to navigate separate programs with multiple logins, a dashboard could serve as a unifying portal, allowing distributed systems to act more as a functional whole (Figure 3). Finally, as groups of radiologists consolidate and form networks, a dashboard could help triage and distribute the workload by keeping the whole team apprised of the workflow status, thereby avoiding missed or overlooked cases (Figure 2). Why will support staff like it? 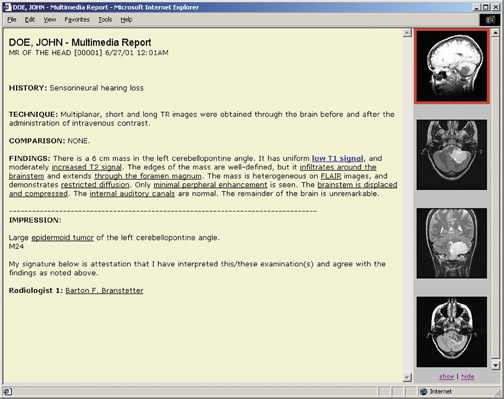 Computer support staff and PACS administrators will also find a radiology dashboard useful. As more computer systems are integrated and interfaced, 1,2 PACS administrators and support staff are faced with the dizzying task of connecting, maintaining, diagnosing, and correcting all these systems. Hardware, software, and networking variables all must be coordinated with precision for system stability, and a dashboard could facilitate this process. For example, a dashboard could monitor the "health" of the many devices in the system (ie, remaining hard disk space, processor consumption, and available memory). The dashboard could also monitor the status of the applications or processes that should be running (eg, connectivity, application events/errors, and central processing unit consumption). 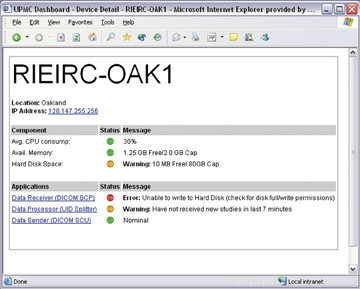 If a process hangs or a device becomes unstable, the dashboard could alert the support staff immediately to allow for a quick resolution (Figure 4). Though these types of self-monitoring tools may already exist for individual applications and systems, a dashboard could summarize key information in one place for simplified system monitoring. Then, instead of identifying problems through crisis, support staff can take a more proactive, pre-emptive view-seeing the "forest" as well as the "trees." Why will the financial administrators like it? Using a dashboard as a means for summarizing information is not a new concept to administrators, as they have used financial dashboards for many years. With their focus on economic viability, administrators will appreciate the dashboard's potential to simplify system management. Simplification translates into savings when fewer people are required to support and maintain the multiple interfacing systems. 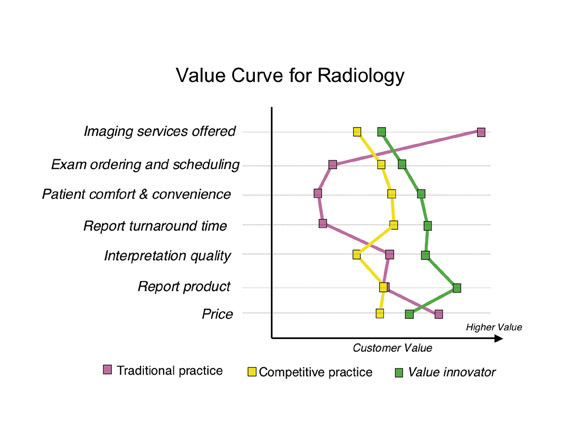 Furthermore, insofar as a dashboard facilitates "smarter" decisions by radiologists and system administrators, it produces better patient care and a better value to the referring clinician-and that, bottom line, is better business. Radiology has been transformed with the advent of digital image management. 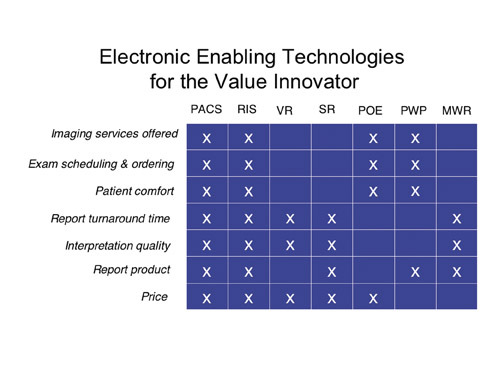 Like stepping from a Model-T Ford into a Formula One race car, today's radiology departments, with their factory-fresh PACS and RIS, are faced with the challenge of understanding and harnessing their new "high-performance" systems but without a user's guide. A digital dashboard empowers radiologists and system administrators to monitor and manage the states of multiple, complex medical information systems by presenting optimized, context-specific information in real-time and, thereby avoiding information overload. This keeps radiologists tightly engaged in the clinical process, allows system support personnel to be proactive, and provides financial administrators with the reassurance that the department is running smoothly. After all, "you can't manage what you can't measure" and whether you work in in radiology or stock-car racing, the process is a lot more than just getting from point A to point B. The radiology dashboard: A user’s guide to a “high-performance” PACS. Appl Radiol.